I probably shouldn’t have to say this one, but apparently I do. 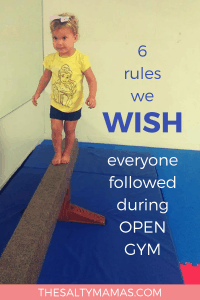 Open gym is generally not a “drop off” situation. If you’re required to stay, it’s likely implied that you’re also required to watch your kids. Now do I think you have to helicopter parent? Nope! I love giving my kids space. If I can, I’m more than happy to stand along the wall and just watch where my kids are and what they’re doing. Do I get to do that often? Hardly! I’m usually running back and forth between kids making sure they’re sharing, taking turns and playing nicely, but I don’t want to get ahead of myself! Hey, these age restrictions are generally more like recommendations, so I’m not saying you can’t come if your kid isn’t quite one or is a few days over five. I have three kids and it’s tough to find activities that are made for all three. So when Izzie was born, I would wear her in the Ergo while the age appropriate kids played. I planned on doing this until she was one and was able to participate. She had different plans and started walking at 8 months. When that happened, she wasn’t content any longer to just be an observer. She wanted to tumble too! But I also followed her like a hawk. Bigger toddlers were all around barreling through the crowds and it’s not their job to watch out for an 8 month old that’s outside the age range for this activity! The reason the age recommendation exists is because kids in the group should be able to play together without too much carnage. So the same goes (doubly!) if I bring my 5 year old. He’s a big kid and needs to be EXTRA cautious of the kids that are supposed to be here enjoying the activity. So bring your kids, but be extra aware. This one is HARD. And it’s generally the reason I don’t get to hang out against the wall just watching. Because two and three year olds aren’t really equipped to manage the whole turn taking process. So far we’ve yet to come up with a better way that doesn’t end in tears, bloodshed, and maybe some teethmarks if my 2 year old is involved. Let’s face it: the kids aren’t going to do it on their own. They need LOTS of gentle reminders about where the end of the line is and how you have to wait until you’re at the front of said line for your turn. Then the friendly reminder that you only get one turn at a time. Repeat until the hour is up. And do that every week until your kid ages out of the system. It is tedious work, but someone has to do it, and in my experience, lots of kids are not real interested in learning this lesson from another Mommy, despite how often I try. I get it. Your kid takes Tiny Tumbling and has a whole routine on the bars. But here’s the thing: Our kids are all doing “one thing” on the bars before their turn is over. 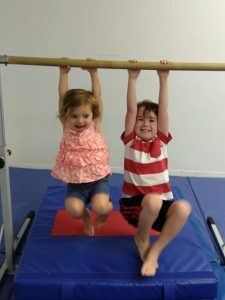 Your kid is doing a hang and a flip and another flip and a “look at what I can do!” But this isn’t her exhibition show and we’re all working REALLY hard on teaching our kids about those turns I just mentioned. So please, tell your kid she’s great, but that she’s gotta do one flip like the rest of us and then back of the line. Look, I LOVE squeezing in some Me Time. It’s like 98% of the reason I have a YMCA membership. But when I’m at tumbling I know I’m just close to Me Time (I drop my kids off at the Kids Club after!) rather than in it already. Do I keep my phone in my pocket? Sure. Do I take pictures of my kids? Absolutely. But do I sit and scroll through IG or Twitter? Unfortunately, no. Don’t get me wrong – I would LOVE to and I understand the urge. Especially when your kid is playing and doing great and clearly doesn’t need you so you can just enjoy yourself for a few minutes right? Somehow kids seem to know when you’ve let down your guard – and picked up your phone. Smart little things they are, they’ve also figured out that being naughty is a great way to get some attention. And a room full of other kids is ripe with opportunities to knock someone over, steal a turn, or just plain throw a fit. At the end of our tumbling class, the kids giggle and squeal for parachute time. The adults shake the chute, lift it high, wiggle it low and trap the kids underneath. Then the kids run out and sit on top while we walk around in a circle taking them on a little ride. And they LOVE it. However, I don’t love seeing a group of Moms over in the corner chatting while I haul their kids around. It’s not a huge deal, but if you find yourself off to the side while all the other Moms are participating in an activity, you might want to scan the crowd to see if anyone else has a forced smile plastered on. Hop on in, laugh it off with a “Whoopsie!” and we’ll never mention it again! In the interest of full disclosure, I’ve probably broken all these rules myself. Kids are hard. Rooms with lots of kids going rogue is extra hard. And I am team “It Takes a Village.” So come, hang with the village, but be a part of it too. Open gym only lasts an hour, and we’re gonna make it Mama!